You must be a member of the Gent Book and Culture Group to attend this activity. Would you like to join this group? In an unnamed Portuguese village, against a backdrop of severe rural poverty, two generations of men and women struggle with love, violence, death, and—perhaps worst of all—the inescapability of fate. A pair of twins conjoined at the pinky, a Protected content wise man, a shepherd turned cuckold by a giant, and even the Devil himself make up the unforgettably oddball cast of The Implacable Order of Things. 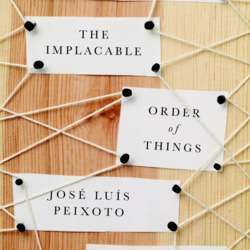 As these lost souls come together and drift apart, José Luís Peixoto masterfully reveals the absurd, heartbreaking, and ultimately bewitching aspects of human nature in a literary performance that heralds the arrival of an astoundingly gifted and poetic writer.